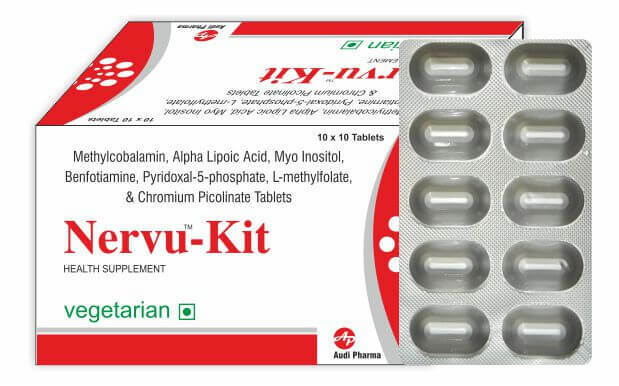 This is synergistic combination of the nutritional substances - helps in diabetic neuropathy. Neuropathy is damage to nerves, and diabetic neuropathy is damage to nerves that occurs as a result of diabetes. Diabetes is thought to damage nerves as a result of prolonged elevated levels of blood glucose. Diabetic neuropathy can affect different parts of the body, and symptoms can range from mild to severe. Diabetic neuropathy is the most common complication of diabetes. Nerve damage or diabetic neuropathy resulting from chronically high blood glucose can be one of the most frustrating and debilitating complications of diabetes because of the pain, discomfort and disability it can cause, and because available treatments are not uniformly successful. Neuropathic pain is the most common chronic complication of diabetes mellitus. The mechanisms involved in the development of diabetic neuropathy include changes in the blood vessels that supply the peripheral nerves; metabolic disorders, such as the enhanced activation of the polyol pathway; myo-inositol depletion; and increased non-enzymatic glycation. In this supplement Methylcobalamin is an essential nutrient for neurons and Alpha Lipoic Acid is a powerful antioxidant that protects the neurons from oxidative stress. The ratio of Methylcobalamin, Pyridoxal-5-phosphate and L-Methylfolate helps in bringing down the plasma level of homocysteine, the major risk factor for Atherosclerosis. Alpha Lipoic Acid prevents plaque formation in the arteries by preventing LDL oxidation. Thus this combination reduces the major risk factors for Atherosclerosis. Antioxidant Benfotiamine exhibits direct antioxidative capacity and prevents induction of DNA damage in vitro. Inositol is a vitamin-like substance. Inositol is used for diabetic nerve pain, panic disorder, high cholesterol, insomnia,cancer, depression, schizophrenia, Alzheimer's disease, attention deficit-hyperactivity disorder (ADHD), autism, promoting hair growth, a skin disorder called psoriasis, and treating side effects of medical treatment with lithium. Healthy blood sugar levels - the foundation of nerve health. Healthy nerves to alleviate direct nerve damage and its symptoms. Healthy blood circulation to the nerves to indirectly support relief of diabetic neuropathy. Alpha lipoic acid (ALA) is found naturally in the body. It has many interesting properties including being a powerful antioxidant and anti-inflammatory. High blood sugar levels are associated with excess generation of highly reactive free radicals and oxidative stress. ALA promotes antioxidant effects in the body mostly by directly eliminating harmful free radicals. It also appears to play a role in blood sugar levels as well as having an apparent beneficial effect on managing the symptoms of diabetic neuropathy. Typical use Of Alpha Lipoic Acid: Antioxidant, As A Supplement For Diabetes Mellitus, Diabetic Neuropathy, Vascular Disease, Cognitive Decline And Dementia. Benfotiamine is a dietary supplement that is derived from vitamin B1, known as thiamine. Benfotiamine quickly converts to high levels of an active form of thiamine. The primary benefit of this supplement for diabetics with nerve damage in the feet and legs is due to its strong "anti-AGE" properties. "AGEs" are Advanced Glycosylation End products that form as a result of excess sugar in the blood. Excess blood sugar will "stick on and in" nerves, blood vessels, and many other vital structures in your body causing AGEs. In the feet and legs this can potentially result in nerve pain and other diabetic complications because the nerves can't work well with sugar "stuck on them." The anti-AGE effect of benfotiamine makes it potentially helpful not only for the management of diabetic nerve damage, but also for diabetic kidney disease and diabetic eye disease. Some recent studies have also shown additional non-AGE related benefits of benfotiamine. One of these benefits is its support of glucose sugar use by the body, as well as influencing the passage of nerve signals. Because of these properties, as well as its strong anti-AGE effect, benfotiamine can be a option for patients with diabetic polyneuropathy. Typical use of Benfotiamine: Beri Beri, Wenicke-korsakoff Syndrome. Diabetic neuropathy. Mecobalamin is another form of vitamin B12. It is the active form of vitamin B12 found in better DPN supplements. Vitamin B12's main functions are in the formation of red blood cells and DNA that make up your genes. It is involved in having a healthy nervous system, and plays a vital role in the metabolism of healthy fats essential for maintenance of the important covering that surrounds your nerves known as the myelin sheath. In the diabetic, B12 is typically used to assist in the management of diabetic neuropathy, and for general nerve health. The main property of vitamin B12 that has been studied for DPN is its role in managing homocysteine levels - Elevated levels of homocysteine in the blood have been associated with poor circulation, and it is believed that the decreased circulation in the tiny blood vessels that feed the nerves are part of the problem in people with DPN. Typical use Of Mecobalamin: To cure low hemoglobin or red blood cells (pernicious and megaloblastic anemia), loss of sensation and pain in extremities (neuropathy). Also used as adjunct therapy in rare conditions that involves severe muscle tightness and decrease in muscle mass (amyotrophic lateral sclerosis). Pyridoxal-5- phosphate is the active form. It is involved in many areas of your metabolism, from the formation of hemoglobin that carries oxygen in your blood, to the working of your genes, to the release of stored-up glucose in your muscles, and many other important actions including the formation of the biologic chemicals that nerves use to "talk to one another." And like vitamin B12 it is also involved in the formation of the covering for nerves - the myelin sheath, this is one way in which it is directly supports nerve health. Typical use Of Pyridoxal – 5 - phosphate: This medication is a vitamin, prescribed for the treatment and prevention of vitamin B6 deficiency. It is important for the breakdown of protein, fats, and carbohydrates from foods. Folate, yet another B vitamin (B9), is also essential to many of body's functions. The human body needs folate to make, repair, and regulate DNA, to develop red blood cells, to support good nervous system function, and to act as a cofactor in many of the biological reactions that keep you healthy. Folate participates in the breakdown of fat in fat cells and may have some role in the prevention of obesity and type 2 diabetes. Many people know that diabetes is a disease of blood sugar control, but many do not know that it is also a disease of fat storage. Any dietary nutrient that plays a supportive role in proper fat metabolism needs to be a regular part of the diabetes and pre-diabetes diet. Once eaten folate must chemically change to become the activated, functional L-methylfolate. The better supplements for DPN contain L-methylfolate so the active form of folate is being directly delivered to your system without having to go through the conversion process. Typical use Of L – Methyl Folate: Used in anemia (low red blood cells) due to folic acid deficiency, pregnancy or as a side effect of certain drugs, kidney disorders, malabsorption syndromes, and to prevent birth defects in infants. Inositol is a type of sugar in the human body that plays an essential role in human health and disease. Inosital's diverse roles include maintaining cell structure and facilitating cell signaling. There are nine chemical isomers of inositol, of which myo-inositol is the most abundant. Myo-inositol is readily consumed through foods and absorbed into the bloodstream. Concentrations are particularly high in peripheral nerve tissues, where decreases in myo-inositol have been associated with diabetic neuropathy, a type of nerve damage caused by prolonged high blood sugar. Typical use of Myo-Inositol: Myo-inositol supplements are sought by some individuals with diabetes to cure diabetic neuropathy. Myo-inositol is readily available in supplement form, and is commonly called vitamin B8. Chromium is an essential trace mineral that plays a role in the metabolism of glucose and in supporting healthy blood sugar levels in people with diabetes. It benefits nerve health in diabetes and pre-diabetes through this well-known ability to support healthy blood sugar levels. Chromium positively supports healthy blood sugar levels and support insulin sensitivity, and healthy blood sugar levels in some diabetics. Optimal levels may reduce insulin resistance, improve blood sugar control, and may help to reduce the risk of cardiovascular disease and type- 2 diabetes. Supplementation may also help to reduce triglycerides and total cholesterol while improving HDL "good" cholesterol. Typical use of Chromium:It is an essential part of metabolic processes that regulate blood sugar, and helps insulin transport glucose into cells, where it can be used for energy. Chromium also appears to be involved in the metabolism of carbohydrate, fat, and protein. It helps to reduce the excess biosynthesis and accumulation of a variety of glucose metabolites, including glyceraldeyde-3-phosphate and dihydroxyacetone phosphate. Increased concentrations of these glucose intermediates serve as a trigger to many of the mechanisms responsible for hyperglycemia-induced cell damage. Benfotiamine increases tissue levels of thiamine diphosphate, in turn increasing transketolase activity and resulting in a significant reduction in glucose metabolites. Inositol is synthesized from glucose-6-phosphate and metabolized to phosphatidylinositol, which makes up a small, but very significant, component of cell membranes. It helps to reduce the excess biosynthesis and accumulation of a variety of glucose metabolites, including glyceraldeyde-3-phosphate and dihydroxyacetone phosphate. Increased concentrations of these glucose intermediates serve as a trigger to many of the mechanisms responsible for hyperglycemia-induced cell damage. Benfotiamine increases tissue levels of thiamine diphosphate, in turn increasing transketolase activity and resulting in a significant reduction in glucose metabolites. Inositol is synthesized from glucose-6-phosphate and metabolized to phosphatidylinositol, which makes up a small, but very significant, component of cell membranes. Benfotiamine is absorbed much better than water-soluble thiamine salts: maximum plasma levels of thiamine are about 5 times higher after benfotiamine, the bioavailability is at maximum about 3.6 times as high as that of thiamine hydrochloride and better than other lipophilic thiamine derivates. Due to its excellent pharmacokinetic profile this combination should be preferred in treatment of relevant indications. Alpha-lipoic acid is absorbed from the small intestine and distributed to the liver via the portal circulation and to various tissues in the body via the systemic circulation. Alpha-lipoic acid readily crosses the blood-brain barrier. It is found, after its distribution to the various body tissues, intracellularly, intramitochondrialy and extracellularly. Alpha-lipoic acid is metabolized to its reduced form, dihydrolipoic acid (DHLA), by mitochondrial lipoamide dehydrogenase.